Confessions - Description | W. W. Norton & Company Ltd. This translation of Confessions enlivens the beguiling world of late antiquity. 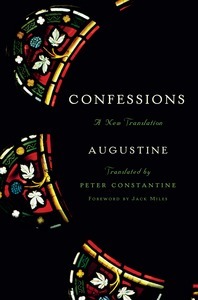 No modern, well-versed literature lover can call their education complete without having read Augustine’s Confessions. One of the most original works of world literature, it is the first autobiography ever written, influencing writers from Montaigne to Rousseau, Virginia Woolf to Stephen Greenblatt. It is here that we learn how one of the greatest saints in Christendom overcame a wild and reckless past. Yet English translators have emphasised the ecclesiastical virtues of this masterpiece, at the expense of its passion and literary vigour. Restoring the lyricism of Augustine’s original language, Peter Constantine offers a masterful and elegant translation of Confessions. This Norton Critical Edition is based on Peter Constantine’s incomparable translations, which are introduced and annotated by the renowned Babel scholar Gregory Freidin. Three thousand years of the greatest Greek poetry, exquisitely translated and assembled in a handsome volume sure to be a modern classic.